The Syrian city of Aleppo has hardly been out of the news over the past four years – sadly, for all the wrong reasons. The images we see in the media today are of a city large parts of which have been reduced to rubble. Thousands of people have been killed; many more have fled. I was fortunate enough to visit Aleppo in more peaceful times, before the destruction and bloodshed. I wrote about my experience there and included it in From Souk to Souk. Although peace is probably still a long way off, just before Christmas 2016 it seemed that a critical stage in the battle for the city has now been reached. To mark this turning point, I decided to feature here on my website the ‘Aleppo chapter’ out of From Souk to Souk. 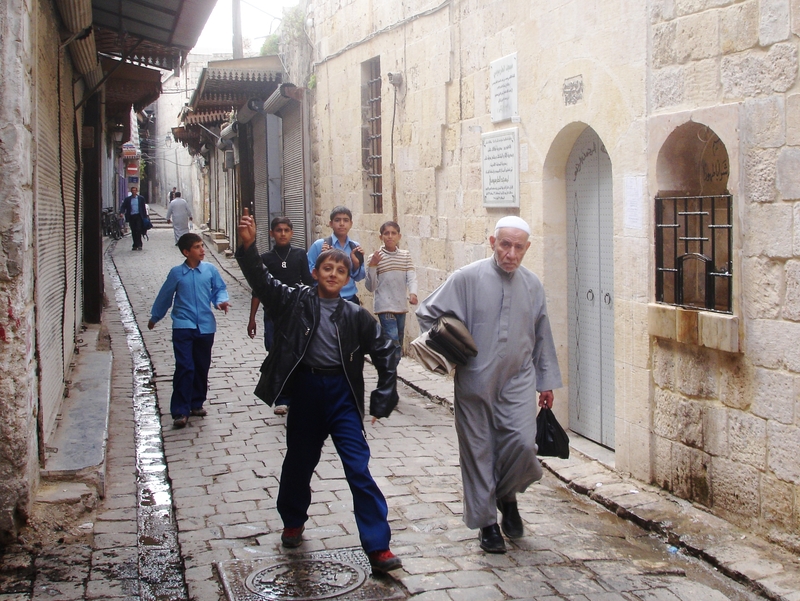 It’s based on my visit to Aleppo in 2008, when life there was normal. I hope it’ll give you the opportunity to get another perspective of the city, of how it was before the war. I’ve reformatted it, but otherwise it’s as it appears in the book. Tell me, have you ever visited somewhere famous or steeped in history and afterwards found that your abiding memory of the place is not of a monument or spectacular building, but of something else, something seemingly insignificant or small, something human? This happened to me in Aleppo. Let me tell you about it. 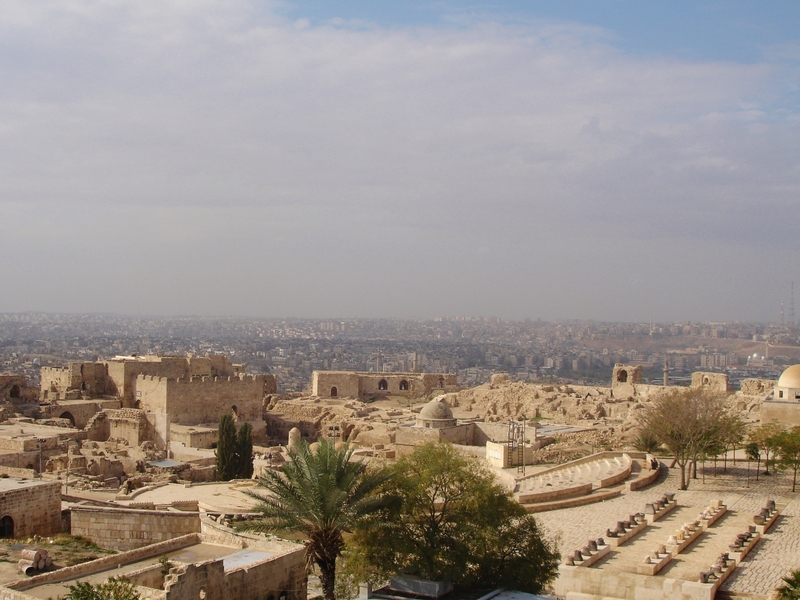 Like many cities in the Middle East, Aleppo has been continuously inhabited for millennia, perhaps since 5000 BC, a mind-numbing period if you try to calculate the number of generations who were born and have lived and died here: maybe as many as four hundred. Unsurprisingly, Halab, to give it its Arab name, is a millefeuille of human settlement in the region made up of layer upon layer of history. The catalogue of powers that have ruled or governed the city reads like the contents list of an encyclopaedia of great civilisations and empires: Greeks and Romans, Sassanids and Mongols, Byzantines and Turcomen, Ottomans and French, and many others besides. Alexander the Great, Saladin and Tamerlane each succeeded in wresting control of the city, yet, if they are remembered today, it is not for their conquest of Aleppo. The crusaders, on the other hand, twice tried and failed to take the city, and the names of few of them, if any, have survived the passage of time. Yet, many of those who came to Aleppo did leave their mark here: in its architecture, in its art, in its music, and in its food. Some, as I was to discover, left an enduring legacy of a different sort. I arrived after driving from Hama, a small town some 150 kilometres to the south renowned for two things: its giant wooden water wheels, or norias, that churn slowly in the Orontes River with a distinctive cracking, creaking sound and, rather less picturesquely, the 1982 Hama Massacre when government troops shot thousands of the city’s inhabitants. Aleppo was the latest stop on a tour of Syria I made when the Assad regime’s position was still unchallenged. Top of my ‘must see’ list were the city’s vast medieval citadel and its celebrated souk, of which I had heard so many stories. I had a map and a mobile phone, but locating my hotel was a challenge and I found myself going back and forth along the same stretch of road outside the old centre, desperately trying to join up the hotel receptionist’s directions with the nondescript concrete buildings around me. 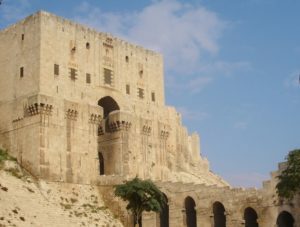 Finally, I came across a patch of rough land full of parked cars at the far end of which stood Bab al-Qinnesrin, one of the nine city gates hewn from the nougat-coloured limestone from which much of old Aleppo is built. I parked up and headed into the heart of the historic city, wheeling my duffel bag behind me as the gentle November sun slipped towards the horizon. The dimensions of the imposing gate were deceptive, but the actual entrance was only accessible on foot or with a handcart. I made my way through the shadowy vaulted chambers of the gateway. In one, a handful of youths lingered in the darker recesses, their whispers ceasing as I walked past; the only noise was of pigeons fluttering up to barely visible ledges. The entrance to the hotel was unpromising, not to say alarming: a narrow stone corridor that sloped downwards into darkness, it looked more like the opening to a pharaoh’s tomb. I took a deep breath and stepped into it, a sensor-triggered light immediately revealing an old wooden portal at the end. I rang the bell and moments later the door creaked open, a slim man in his forties beckoning me inside with a hand so hairy it looked like a tarantula crawling out from the end of his suit sleeve. In perfect English he introduced himself as Nazim and bade me enter. As is often the case in the Middle East, the building’s unassuming exterior gave nothing away as to the wonders concealed behind its simple walls. After just a few paces following Nazim’s silhouette, I found myself in the courtyard of a beautifully restored sixteenth-century merchant’s palace. In this dusty corner of Syria, it was a hidden oasis of chic where a bubbling fountain and an iwan – the three-sided portal open at the front and typical of Islamic architecture – invited me to forget the world outside and come and relax on the rows of satin cushions along its walls. The courageous investment its owners had made was testimony to their belief in Aleppo’s potential as a tourist destination. Nazim smiled when he saw my face, his cold green eyes glowing with satisfaction. That night, in a nearby restaurant, I reflected on a grand city’s gradual decline into relative obscurity. I asked myself how some of today’s metropolises would be seen a few centuries hence and wondered if they, too, would be relegated to being historical ‘also rans’ as power waxed and waned and trade routes changed. As I scooped up a mouthful of garlicky hummus with a piece of hot flatbread, a waiter asked me if I was enjoying my meal. Looking up to reply, I was surprised to see not a swarthy Arab but a fair-skinned man with red hair. And he was not the last I was to see in Aleppo. The next day, I set off to explore Syria’s largest city. Busy and bustling, and with a population a third bigger than the capital Damascus, Aleppo still feels overwhelmingly provincial. The opening of the Suez Canal in 1869 saw trade that had previously passed through the city being carried by ship instead. During the 1920s Turkish War of Independence, Ataturk seized a large chunk of territory from the newly established state of Syria, meaning much of the city’s natural hinterland lies on the wrong side of the border. The result is that it is no longer the commercial and cultural crossroads it used to be. To the visitor, the sense of isolation is heightened by the fact that Aleppo sits in a far corner of a country off the main tourist circuit. My first stop was the famous citadel, the Qal’at Halab, a massive limestone construction based around an elliptical hill and surrounded by the remains of a vast twelfth-century moat, dangerously deep, unwelcomingly wide. Human settlement of the hill dates back to the third millennium BC, but it was not until some two thousand years later that the first fortress was built. The size of the fortifications that, even today, dominate Aleppo leave you in no doubt as to the one-time importance of the citadel and the city at the centre of which it stands. Most of the impressive remains that now rose in front of me dated from the Ayyubid dynasty founded in the twelfth century by that most famous of the crusaders’ foes, Saladin. As I wandered up the long stone bridge, its six high and slender arches leading from the outer to the inner gate, I found myself imagining bloodthirsty battles of yore with swarms of foot soldiers storming the castle under a hail of whishing arrows. Inside the main gateway, the passage took one right angle turn after another, a ploy exercised to make life difficult for invaders, not least by preventing the use of battering rams. Above me, machiolations served as a grim reminder of the boiling liquids that those inside used to pour onto attackers trying to seize the castle. I paused and contemplated the violence that would once have filled the tranquil space in which I now stood: the shouts and cries of man and beast, the sound of metal upon metal as swords clashed again and again, the stomping of countless marching feet – quite simply, the sounds of siege. Now, as I stood there, the battles and bloodshed were no more and if the ghosts of those who died fighting here wandered the ruins they did so without leaving the faintest trace of sorrow or melancholy. The citadel, partly restored at the beginning of this century, was a peaceful place and grass and wild flowers grew where the inhabitants of this city-within-a-city once went about their daily business. Young couples sat quietly on the low stone walls, discreetly holding hands and casting furtive glances as I walked past. I made my way slowly round the rocks and rubble, pausing now and again to gaze at the urban sprawl below, the noise of its traffic seeming to belong to a different world. Nowadays, Aleppo, home to over two million people, extends across an area unimaginable to the ancestors of its current citizens. Looking out from the ramparts, I tried to imagine how somebody from centuries ago would react upon seeing the vast city as it is today. Beyond the historic core, Aleppo is not a pretty sight: seen from the hilltop fortress, it is but one more beige metropolis, something in which the Middle East excels. Just beyond the citadel lies the souk, a veritable Aladdin’s cave in which it is difficult not to get lost. Numerous friends, assuring me it was a highlight not to be missed, had raved about its authenticity. Not here some pastiche filled with overpriced bric-a-brac aimed at tourists; this was where many in the city did their daily shopping. Made up of more than a dozen separate markets, Aleppo’s bazaar is still, as it was in the times of the Silk Road, the largest in the world and is said to be one of the best in the region. Each market specialises in a particular type of produce such as foodstuffs, cotton goods, jewellery or ironware, its unfathomable network of cobbled streets and passages criss-crossing a gently sloping hill under a roof of vaulted stonework and corrugated metal. As I walked into the souk, I left behind the bright sunlight of the Levantine autumn and entered a world illuminated by a curious mix of electric bulbs, ornate lanterns and shafts of light falling through centuries-old oculi in the arched ceilings. Men and boys hurried about, transporting all manner of wares, faces glistening as they laboured to push hand trolleys piled high with heavy boxes and bulging sacks. Shoppers went about their business, buying, bargaining, arguing and joking while dark-haired youths sauntered arm in arm, pausing to chat with friends working on stalls, and women in headscarves perused packs of socks and bags of tea. I saw more scarves in the souk in Aleppo than anywhere else I have ever been: stacked practically, draped seductively, hung demonstratively, they tempted even the most resolute to succumb to looking, even if not buying. The vendors were keen to convince me that half their stock was pashmina and, whenever I paused to look at their merchandise, hurriedly began unfolding one scarf after another, inviting me to feel the quality, not look at the width, or the Syrian equivalent thereof. ‘Genuine pashmina!’ I heard the stall owner proudly declare as I stopped to look at a particularly splendid example in blue and green. I looked up to see a titian-haired man smiling at me, his skin as pale as any European’s. I felt the soft cloth between my fingers, its gentle fabric warm to the touch. He would make me a special price, he beamed, blue eyes twinkling. I wanted to ask him about his fair features, but feared he would consider me rude, so smiled and said I was just looking and that I might come back. As I continued along the narrow passages, marvelling at the cornucopia of goods, a voice calling out behind me in Arabic gradually fought its way into my consciousness. Turning round, I had just enough time to leap out of the way of a tired-looking and rather grubby grey donkey on which sat an old man. A gnarled hand protruded from his beige thobe, fingers like polished twigs clutching tattered reins, but the scrawny beast seemed to know where it was going anyway. From under the off-white scarf draped over the man’s head, I caught a glimpse of a face that could have been carved from the root of a tree. I watched as the strange pair turned and disappeared ‘off stage’ down one of the passages like extras from a play who have performed the same role for longer than anyone can remember. Approaching a stand selling bathroom soaps and sponges, I saw a giant of a man deep in conversation with the young storekeeper, gesticulating with his hand, circling a finger as big as a sausage. Spotting me, his interlocutor held up a rectangular bar of dark green soap and waved me across. With his immaculately coiffed black hair and tanned skin, he resembled so many other men in this city; only a scar on his left temple made him stand out. Picking up another bar from the top of a pyramidal display surrounded by loofahs and dried starfish, he invited me to smell the hand-made soaps. With theatrical enthusiasm he held the bar to his face and sniffed deeply, eyes half closing as if momentarily transported to another, less mundane place. I walked over and took the soap from his outstretched hand, trying not to look at his scar. A rough, square block, it had the unmistakeable fragrance of laurel. I realised it must be the famous Aleppo soap made from olive oil and reputed to have been used by beauties of antiquity such as Queen Zenobia of Palmyra and Cleopatra. I could feel the stallholder’s eyes on me as I rubbed my fingers over the tablet with its calligraphy imprint. As if reading my mind, he assured me it was not expensive, yet of the finest quality. His tall friend said something to him in Arabic. I looked up and saw he was an albino, his pale skin and startling pink eyes incongruous in this most oriental of environments. Only now did I notice wisps of white hair underneath the chequered dark blue scarf wrapped loosely round his head. Eager to regain my attention, the soap seller began listing other perfumes: lavender, vanilla and cinnamon, and pointed enthusiastically to the stacks of soap. His albino friend had seen my surprise and now I was sure he sensed my embarrassment. I handed the bar back to its owner and asked how much it was. ‘Two hundred,’ he said, already wrapping it in brown paper. The albino’s pink eyes darted to his friend. However authentic the market was supposed to be, I suspected I had been quoted a tourist price, but did not want to haggle over a few cents. I handed over my Syrian pounds, took possession of my modest purchase and continued my exploration of the labyrinthine souk. I stopped to look at gleaming brassware and then drifted on as nonchalantly as possible as shopkeepers, ever on the alert for the slightest indication of interest, scuttled towards me like spiders whose web had been touched by a fly. ‘Where are you from?’ they called, but I just smiled in return, knowing that if I took the bait of answering a question I would be stuck in discussion for at least twenty minutes and that a friendly conversation would inevitably turn into an interminable sales pitch from which it would be difficult to escape. Then, as I approached a small crossroads of paths in the cotton souk, a boy, perhaps ten years old, scuttled past the rolls of brightly coloured fabric stacked against the stalls. It was his paper-white hair that caught my eye: he was another albino. I can count on one hand the number of albinos I have seen in my life, so to see two in one afternoon was extraordinary. I wondered if he was the son of the soap merchant’s friend. Eventually, the endless displays of clothing, household goods, dried foods and toiletries lost their charm and what had started out as an exotic feast for the eyes gradually metamorphosed into a prison of endless tunnels of polyester fabric and gaudy plastic. I decided to leave, but no matter which direction I took there seemed to be no way out, just more passages, more people, more hands holding out wares, and an endless chorus of sales pitches. As I remembered reading that the souk’s passages ran to some thirteen kilometres, my chest started to feel tight with claustrophobia bordering on panic. Suddenly, I turned and saw daylight beyond a group of silhouettes drifting at the end of a passage. Once outside, I drank in the delicious autumn air before strolling, relieved, to the modern area of the city. It was dusty and noisy, busy and, in parts, crowded. My throat was dry and the city air, which only moments ago had provided a welcome respite to the suffocating atmosphere of the bazaar, was now revealing itself as a warm, gaseous soup of exhaust fumes. I stopped for a drink at one of the pavement cafés and made myself comfortable on a plastic chair that had once been white. I watched the passers-by going about their daily business, carrying bags of shopping, talking to their children, rushing to appointments of which I knew nothing: I was an observer of life here, not an actor in it. The people I saw around me were the descendants of those who had inhabited the city in centuries past, of those who had conquered it, and of those who had passed through. As I sat sipping my iced mulberry juice or sharab al toot, I was struck that in the course of half an hour I had seen half a dozen red- or ginger-haired men. Even in Europe, I would not have expected to see so many. Perhaps the women of Aleppo also counted many redheads among their number, but, as most had their hair covered, it was impossible to be sure, although I thought it likely. After all, red hair is not gender-specific. I began to speculate as to the origin of the gene that was clearly so well established here and wondered if it were a trait left by the crusaders. Even if the Europeans had not managed to conquer the city, they had roamed the area, and no doubt sought to keep themselves amused. But, even more bizarrely, I saw another albino, a man in his thirties, his ghost-like features clearly visible from afar. As he came nearer, I tried not to stare: he had no way of knowing he was the third of his kind I had seen that day. Why there were so many in Aleppo was even more of a mystery than the origin of the city’s redheads. I decided to ask Nazim at the hotel. Seated at his desk in his small, simply furnished office he cut a handsome figure with his designer stubble, perfect smile and flawlessly ironed white shirt. The smile remained on his face, but, as I spoke, his eyes could not conceal a distinct change, an almost imperceptible transition from disconcerting to disingenuous. He twirled his pen in his hairy fingers while politely giving answers that had no bearing whatsoever on my questions, even when, thinking I had not been clear, I repeated them. Finally, putting the pen on the desk, he leant back in his chair, folded his hands in his lap and said he hoped I was enjoying my stay in the city. I was intrigued: there was no doubt about him having understood, but, clearly, he was not about to enlighten me. The next day, I continued my exploration of the city, returning with almost masochistic curiosity to the sprawling souk. The second time round, it had an air of familiarity, the overbearing atmosphere of the day before having now evaporated. If I had tried to find him it would have been impossible to do so in the perplexing maze of passages, but, after wandering about for half an hour, I suddenly found myself just a few paces from the stall owned by the titian-haired scarf seller. His eyes lit up the moment he saw me. He greeted me as his friend and, rejoicing that I had returned, hurriedly reached for what he described as a ‘beautiful, genuine pashmina scarf’. I examined it, not sensing any great urge to splash out and turning it this way and that with a hint of affected disdain. The scarf seller let it be known that he would make me a special price and asked how much I wanted to pay. As little as possible, I told him, not untruthfully. I let go of the scarf and let my eyes wander indifferently to the curtains of others that lined the small stand. He asked me where I was from. Curiosity got the better of me. I decided to risk causing offence and asked him the same, saying that his blue eyes and red hair seemed unusual for the Middle East. He looked at me for a moment, evidently nonplussed, before saying he was from Aleppo, while he opened out another scarf and held it towards me. Raising my eyebrows, I explained that he looked as if he was from Northern Europe and that I had been surprised by how many people I had seen in the city with red hair. He glanced across to his dark-haired countryman on the stand diagonally opposite who, out of the corner of my eye, I could see was following our conversation with interest. He told me his hair colour was quite common in Syria, including in Damascus. When I countered that Arabs had dark hair, he said some people thought it came from the Kazakhs brought to the region many centuries ago as slaves. I speculated it might come from the crusaders, but he shrugged and did his best to turn my attention to a midnight blue and emerald scarf he was unfolding. I preferred the first one and, after some gentle haggling, we agreed on a price. As the stallholder was folding my purchase and slipping it into a thin, blue plastic bag, I decided I would try once more and asked him about the albinos. For a moment, he did not react and seemed to be considering his answer. Then, handing me the bag, he said nobody knew where they were from, adding, after a brief pause, that they were special. I said goodbye to the titian-haired stallholder, sensing he was relieved that the conversation was over and hearing as I walked away the man opposite say something to him in Arabic. I was now a proud owner of a smart scarf, as well as a bar of soap fit for a queen. Aleppo’s souk might not be aimed at tourists, but, among all the everyday articles, there are still enough little gems for the visitor to discover. I later read that the Mamluks who governed Aleppo in medieval times were, like the Kazakhs, originally brought as slaves, in their case from Circassia, a land in the Caucasus region. The Circassians were known for their red hair; indeed, in the fourteenth century a red-haired Mamluk even became sultan of Cairo. Was my scarf seller a descendant of one of these slave warriors who rose to become a politically important caste, I wondered? Or did his origins perhaps lie with the crusaders after all? I contemplated what they would have thought had they known that the product of their loins would still be visible in the city centuries later. They failed to take the citadel, they failed to take the city, and their names are mostly forgotten, but could it be that in twenty-first-century Aleppo the genes of at least some of them are here for everyone to see? As for the albinos, the puzzle remains. I have searched for clues about them, but to no avail.